Explorer Dirk Pitt (Matthew McConaughey) and his slacker sidekick (Steve Zahn) embark on a treasure hunt through West Africa in search of what locals call the Ship of Death, a lost Civil War battleship that may house a very valuable cargo. Doctor Eva Rojas (Penélope Cruz) warns them that the ship may be linked to mysterious deaths in the area. $18.068 million on 3154 screens. What the heck happened to Matthew McConaughey? I remember when he starred in 1996’s A Time to Kill, he seemed poised to become the next big leading man. That never seemed to occur. McConaughey has managed to eke out a career as the lead in second-tier efforts ever since, but his big break-out role eludes him. 2005’s Sahara represents yet another of these “caretaker” parts. Admittedly, the movie had some potential to become a hit. A big action effort, it looked like it could follow in the same footsteps as 2004’s National Treasure and find an audience. 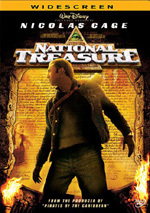 However, Treasure had Jerry Bruckheimer behind it, and apparently that makes a difference. While Treasure raked in $172 million at the box office, Sahara fizzled with $68 million. That’s not a terrible take, but it sure didn’t live up to expectations for a flick that looked primed to start a franchise. Maybe it still will, but Sahara doesn’t launch things with much of a bang. The film starts with a prelude in 1865. A Confederate ironclad ship the Texas becomes the last one to run the Union blockade, but it mysteriously disappears with millions in gold coins on board. Naval historian/explorer Dirk Pitt (McConaughey) runs a salvage operation with his buddy Al Giordino (Steve Zahn) and he also obsesses over the location of the lost ship. He ends up in Lagos, Nigeria, which is also where World Health Organization worker Dr. Eva Rojas (Penelope Cruz) currently resides. She frets about a potential outbreak she thinks comes from Mali and want to head there, but her superiors at Who fight this. Others aren’t too happy about her investigation as well. Some mysterious locals attack and nearly kill Eva, but Dirk comes to her rescue. When she comes to, she finds herself on Dirk’s salvage boat and meets Al and others like retired Admiral Jim Sandecker (William H. Macy), the NUMA (National Underwater Marine Agency) rep who organizes these missions. 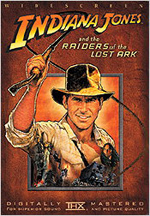 Dirk helps raise a lost treasure but irritates Sandecker when he misses its debut at the museum along with a meeting with money-man Yves Massarde (Lambert Wilson). He has contacts in Mali, which Eva uses to put pressure on her superiors to get her there to combat the potential plague. Dirk’s obsession with the Texas – alleged to be lost somewhere in Africa – is what takes him from his duties. He gets a lead that says it may be in Mali, so he manages to convince Sandecker to allow him three days to search for it. Eva and her coworker Frank (Glyn Turnman) hitch a ride so they can investigate the outbreak. The rest of the film follows his pursuit of the Texas, how this brings him back into contact with Eva, and assorted complications. Romance and adventure ensue. Or at least promised romance and adventure ensue. Unfortunately, the movie never lives up to its obligations. Sahara has all the requisite components of a solid action flick, but it remains relentlessly anonymous. Much of the blame falls on McConaughey’s broad shoulders. He seems best suited for quirkier roles like his aging stoner in Dazed and Confused or more down to earth parts like his characters in A Time to Kill or EdTV. Those allow his naturally genial, laid-back personality to come out well. What McConaughey lacks is the strength to pull of a heroic part. Oh, he looks the role here, as he buffed himself up but good for the character. Heck, the initial fight scene seems more interested in showing off his abs than in conveying the action. Unfortunately, that’s the most convincing McConaughey ever seems in the role. He brings very little panache or flair to the part and comes across as surprisingly anonymous. McConaughey takes what should have been a lively character and makes him a bland, forgettable action hero. Zahn does his same old thing as Al. I used to really like Zahn, as he brought a lot to his parts in flicks like Out of Sight and That Thing You Do. However, his act has started to wear thin, partially because he usually appears in bad movies. Zahn doesn’t harm Sahara but he doesn’t bring anything special to it either. And then there’s Cruz. Utterly unconvincing as a doctor, her role exists as a combination of plot device and love interest. Frankly, she’s unnecessary and gets in the way much of the time. She and McConaughey boast zero chemistry as a couple, as they both seem to be from different planets. Speaking of plot devices, I really think the whole issue of the disease outbreak isn’t worthwhile. This eventually becomes a major portion of the story, but it adds little. I believe Sahara would work better as a straight treasure hunt, but it gets bogged down in Dirk’s do-gooder nonsense and loses sight of the original goals. The whole hunt for the Texas gets so lost that it almost feels like a MacGuffin at times. Sahara desperately tries to convince us that it’s fun and energetic, but it never actually becomes either. Fairly tedious and without much excitement, it uses the standard musical montages and action elements but fails to ever kick into gear. Though I like this sort of film, I take little enjoyment from Sahara. 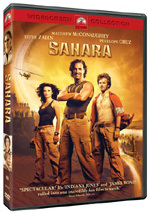 Sahara appears in an aspect ratio of approximately 2.35:1 on this single-sided, double-layered DVD; the image has been enhanced for 16X9 televisions. I expect modern, big-budget movies like this to look great, and Sahara mostly lived up to those thoughts. The main problem came from a predictable source: edge enhancement. Virtually all of the concerns I noticed stemmed from the mild haloes evident throughout the film. Although these never became dominant, they appeared prominent enough to create some distractions and minor softness in wider shots. Otherwise, the movie offered good definition and clarity. I saw no issues with jagged edges or shimmering, and print flaws were virtually non-existent. I saw a couple of specks and nothing else. As one might anticipate for a film set in the desert, the palette of Sahara stayed low-key. Sandy tones dominated, though the occasional rich red or blue would pop up on occasion. The colors looked appropriately distinctive given the film’s production design. Blacks were tight and deep, while shadows seemed nicely smooth and accurately delineated. Lose the edge enhancement and this would have been an “A” level transfer. No such obstacles interfered with the Dolby Digital 5.1 soundtrack of Sahara. The film began literally with a bang, as the opening sequence on board the Texas blasted at us with its big guns. This remained the film’s most impressive use of the audio, but plenty of others presented great zest and impact. The boat chase and the climactic helicopter battle stood out as two other especially memorable pieces. When the soundtrack didn’t assault us, it remained convincing. Music demonstrated good delineation and definition, while effects created a nice sense of place. Quieter scenes didn’t use the surrounds as actively, of course, but they brought out a fine feel for the atmosphere. Across the board, the movie demonstrated solid audio quality. Speech sounded natural and crisp, with no problems connected to intelligibility or edginess. Music was bright and bold. The score offered nice dynamics and clarity throughout the film. As expected, effects played the most prominent role, and they always seemed accurate and distinctive. Bass response was deep and tight, and effects were captured well. I found little about which to complain through this excellent soundtrack. Packed onto this disc, we also get a good collection of extras. Sahara comes with two separate audio commentaries. The first presents director Breck Eisner on his own as he provides a running, screen-specific chat. Mostly technical in nature, Eisner covers a lot of nuts and bolts issues here. He talks a lot about locations and connected challenges. He also gets into sets, visual design and camerawork, music, stunts and effects, the use of various animals, and research/approaches taken by the actors. Occasionally the track drags a little due to the nature of the material, but Eisner usually keeps things peppy and informative. Happily, he never just narrates the movie, and he makes sure we get a good feel for his decisions and the reasons behind them. I may not like the film, but at least this commentary helps me understand various choices. For the second commentary, we hear from Eisner and actor/executive producer Matthew McConaughey. Both sit together for their running, screen-specific chat. Much of the time, we hear information similar to that in the other track. Eisner again talks a lot about sets and locations. However, there’s more of a focus on the work of the actors and the story. We learn a bit about how the performers dealt with their roles and various physical challenges. We also get some notes about bringing Dirk Pitt to the big screen and adaptation issues along with editing and pacing concerns. I can’t say that McConaughey brings a lot to the table, especially during the film’s first half. Eisner dominates the track, though McConaughey becomes noticeably more involved in the discussion during the flick’s second hour. The whole package remains amiable enough; a little dead air occurs, but not a ton. I do feel we hear too much praise. Eisner avoids that trap in the other discussion, but the pair here often tell us how much they like various elements. The commentary simply lacks a lot of fresh information, as it usually comes across as somewhat redundant after Eisner’s more interesting solo track. Odd note: I found it tough to figure out which commentary was taped first. Initially I thought Eisner and McConaughey did theirs first, as the director occasionally makes reference to it in his solo chat. However, he also alludes to remarks in that piece during the McConaughey commentary as well, so it’s not clear which came first. After this we find three separate featurettes. Across the Sands of Sahara runs an even 15 minutes as it presents movie clips, behind the scenes elements, and interviews with Eisner, McConaughey, producers Stephanie Austin, Karen Baldwin and Mace Neufeld, screenwriter James V. Hart, and actors William H. Macy, Rainn Wilson, Penelope Cruz and Steve Zahn. We hear about McConaughey’s pursuit of the Dirk role and his take on the part, why he chose to executive produce it, the various characters and casting, shooting stunts and the atmosphere on the set. Inevitably, some material repeats from the commentary, and a fair amount of fluffy happy talk pops up as well. Nonetheless, I like the shots from the set, and we get enough new information to make this show worth a look. 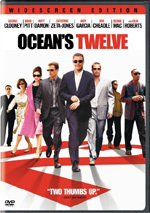 The 20-minute and six-second Visualizing Sahara includes remarks from Eisner, McConaughey, Austin, Neufeld, Zahn, producer designer Allan Cameron, director of photography Seamus McGarvey, costume designer Anna Sheppard, visual effects supervisor Mara Bryan, 2D digital supervisor David Sewell, art director Giles Masters, screenwriter Joshua Oppenheimer, and special effects supervisor Dominic Tuohy. The program covers cinematography and photographic choices, the choice of the 2.35:1 aspect ratio, costumes, camera movement decisions, storyboarding, visual effects, specific sets and locations, creating the Texas, and shooting the boat chase. Much less commentary-repetition occurs here. This program takes a nuts and bolts approach to the making of the film, and it does so well. The length of the show means we rush through most of the topics, but we learn enough about them to get a good feeling for matters. This ends up as an educational and enjoyable piece. Lastly, Cast and Crew Wrap Film goes for nine minutes, 45 seconds. Essentially this is just a compilation of short behind the scenes moments from throughout the shoot. It’s a cute collection but not as interesting as it might sound. Four Deleted Scenes last a total of four minutes, 51 seconds. These include “Kitty Mannock’s Crash”, “Finding Kitty Mannock’s Plane”, “The Long Kiss”, and “Oceanographers Dying In the Desert”. The last two are useless, but the Mannock ones explain how the plane Dirk and Al find ended up there. It was unnecessary for the story, but it’s interesting to see. We can view these with or without commentary from Eisner and McConaughey. As expected, they tell us a few production notes but mostly concentrate on why they cut the sequences from the final film. The remarks are helpful, though some of the information already appears in the feature commentaries. A mix of ads opens the DVD. We get promos for the recent remakes of The Longest Yard and The Honeymooners as well as a new DVD edition of Airplane, “The John Wayne Collection” and Martin Scorsese’s documentary No Direction Home: Bob Dylan. Sahara attempts to give us an action film in the Indiana Jones vein, but it ends up as a lackluster wannabe. The movie never catches fire and lacks the zest and vigor to maintain our attention. The DVD presents very good picture, excellent audio, and a generally useful set of extras. I don’t like the movie enough to recommend it, but fans of the flick should like this solid DVD.